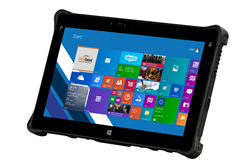 The 11.6” rugged tablet utilizes secure, enterprise-ready Windows 8.1 Pro on a powerful 4th generation Intel® Core™ i5 processor. Designed for the mobile professional needing real-time access to important information anytime, anywhere. Packing all this performance in only 2.7 pounds and an 11.6-inch display, high-powered mobile workers will find the xTablet T1600 to be great productivity tool. Adding to its broad and growing family of innovative tablets, MobileDemand today introduced the xTablet T1600 rugged tablet for business, an 11.6” device engineered for the on-the-go professional seeking top performance in a ruggedized form factor. Industries such as field service, field sales, retail, healthcare, warehousing and public sector will all benefit from this state-of-the-art tablet by enabling them to run full versions of its enterprise software along with standard Microsoft Windows applications in a large screen format. MobileDemand now offers customers the widest variety of form factors and price points of enterprise-grade tablets in the industry. Seven variations of ruggedness, sealing, size, and weight now offer the right tablet for any given job. Microsoft Windows – A Secure Platform for the Modern Enterprise – With Windows 8.1 Professional or Windows 7 Professional, business users no longer have to choose between productivity and convenience as the operating system delivers a touch-first experience for mobile users. Enhancements to Windows 8.1 enable users to easily toggle between the desktop and Start screen, and work via touch or with an optional mouse and keyboard. With the new Assigned Access feature, a device can be locked down to support a single application like a Web browser—a capability that provides greater flexibility when configuring Windows 8.1 devices for the enterprise. High Performance Core i5 Haswell Processor – With the power of a desktop computer in your hands, high performance is ensured with the 4th Generation Intel Core i5 processor, Intel HD Graphics, and solid state drive. Regardless of whether the user is crunching data in large databases or streaming video or complex graphics, high dollar mobile workers won’t be slowed down. Features for Front Line Productivity – The enterprise-ready xTablet T1600 has numerous features and functions to help improve operational productivity and efficiency. Capture high quality photos or video on either of the two cameras, track inventory with the optional high performance 2D imager or HF RFID reader, attach wireless peripherals via Bluetooth 4.0, and even connect to 4G LTE cellular networks for connectivity anytime, anywhere. Sealed and Ruggedized for Outdoors – When work is being done in windblown dust, rain and snow, the xTablet T1600 is IP65 sealed to allow you to get the job done without ruining the tablet. Accidents can happen anywhere, so the xTablet T1600 has ruggedness built-in, designed to withstand multiple drops to concrete, keeping workers on the job and protecting the financial investment. Best-in-Class Support and Service – The xTablet T1600 comes standard with a 3-year warranty with optional extended coverage and is backed by industry-leading service and support from MobileDemand. Adding to MobileDemand Family of Tablets – With the addition of the xTablet T1600, MobileDemand now offers 7 total tablets, enabling the customer to choose the right tool for the job. Starting at $1,995, the xTablet T1600 has the largest screen out of all MobileDemand tablets and is priced competitively, encouraging end users to make the move to rugged. MobileDemand is the nation’s leading provider of rugged tablets used in the transportation industry to improve productivity, anywhere. xTablets are used by mobile workers in many other industries including Oil and Gas, Food and Beverage Distribution, Manufacturing, Retail and Field Service to cut operational costs and improve customer service. The xTablet rugged tablet family ranges from semi-rugged to military rugged and sealed to meet the performance you need for your work environment. They deliver the power, reliable performance and long-term savings companies need to achieve greater efficiency and productivity in the field. In 2013, MobileDemand earned the position of 800 on the Inc. 500/5000 list of the nation’s fastest growing private companies. The company has built its success on a commitment to innovation everywhere – in product design, customer relationships and in its channel. MobileDemand – the right tablet for the job. Additional information is available at http://www.RuggedTabletPC.com.